Bought for class on ancient Greek. 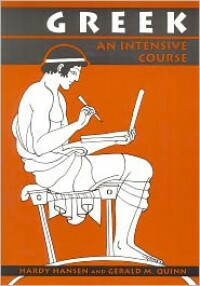 I have tried for a number of years now to learn ancient Greek on my own. I have made some limited progress. I found the Athenaze book to be pretty user friendly. The problem is that I would go through spurts where I would work on it pretty intensively for a while and then I would end up getting distracted. By the time I would get back to it I would basically need to start from scratch. I finally decided that with my last year as an undergrad ( I have already finished most of my degree requirements) that I would take classes on both Greek and Latin. So far this is going well and the time I have spent trying to teach myself has definitely made the work easier. I am quite excited to be learning these languages and the structured environment is definitely a good thing in terms of keeping me at it. As far as this particular work goes, it is quite intensive. As opposed to many other books like Athenaze or Wheelock's, they hit you with a lot of material when they first introduce a topic. So you are expected to learn first and second (both -os and -on forms) declensions, the definite article in all it's many forms and some material about word order and translation, as well as three prepositions and their usage all in the first unit. The next unit on verbs is equally intense. They do break the material up some but my memory is definitely getting a work out. In terms of recommendations, I think this is better for the classroom environment than for solo study as it is pretty dry. For solo study I definitely think that Athenaze is the better way to go.